Over the past few weeks I have been doing Atkins. I have lost about 13 pounds and my weight loss is slowing, but that is pretty normal. I have lost a full pant size which is fantastic. It is to be expected that sometimes you lose inches over weight, especially if you have been active. In addition to being more present and aware in my own life (no more falling asleep at 7:30pm! ), I have been able to enjoy horseback riding for long time periods, volunteering by landscaping for our local Zoo, and playing with my daughter. During the past week I had several cheats. I ate carbs at the Ranch Ride which was catered, then I ate carbs at the lunch for the Zoo Volunteers, and finally on Mother’s day we went out to eat at my favorite Chinese food restaurant. All of it was good and I am so thankful that my body did not pack on the pounds! I am grateful to be able to start over every day and recommit to following my Atkins diet. I have learned various new recipes and found that I can enjoy a greater variety on this diet than I had anticipated. I have learned that losing this weight and becoming healthy is even more important to me than I realized. I love and encourage comments on any and all posts!! :) Please just on in if something catches your eye and let's have a conversation! I know most of the people reading my blog are more than familiar with the facts of life. And no- I am not talking about the birds and the bees. Well, actually I am. Talking about bees that is. But before I get started on that- how about a refresher course. Here is how earth works. Sunshine+Plants=Food for other things=things that dies=food for decomposers=more food for plants. It all comes back to sunshine and plants. Without either one of those things, our planet would very quickly die along with everything on it. Eventually even bacteria and viruses would die for the lack of food and host organisms. Plants are amazing things. They have every way of reproducing imaginable. From broken stems and roots, some plants are able to create an offshoot. From seeds or even spawning new bulbs. But the most typical type of reproduction is still sexual reproduction. Which is a bit hard when your feet are rooted in soil and you can't make your way over the the devilishly handsome geranium from next door. So what is a frustrated plant to do but call in a little romantic help? Bees are the cupids of the plant world. They are enticed by bright colors and intoxicating nectars of various flowers. They rub themselves all over one flower before flying off to snuggle the next one. 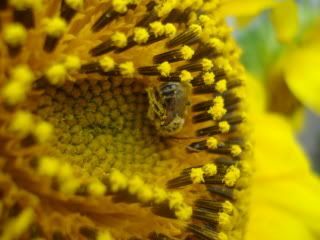 While they diligently stuff pollen into their pollen sacks, they are busy helping bring together flowers from all over the area. But what happens when the bees start dying? In recent years, the world has been suffering from a mass die off of bees. Apiaries are finding their hives abandoned instead of merrily buzzing with workers. Areas which used to be a smorgesboard for summer pollen gathering are strangely quiet. And farmers are finding it harder and harder to find beekeepers who have bees available to "plant" in their fields for pollination purposes. So what happens if the bees are gone? Well say goodbye to the easy to buy fruit in the store. Any produce will have to be hand fertilized. Most all plant based fruits will become wildly expensive and almost impossible to come by. You can look forward for self-propigating foods such as the potato. So watch out for something similar to the Irish Potato famine. Potatoes will soon be our main source of nutrition. However, recent news is coming forward stating that recent surveys of bee populations are finding some species- especially native species are still around. I wouldn't necessarily consider them thriving, but they are still there. Use organic and sustainable practices whenever possible. Build bee houses for Miller bees and consider putting in some hives if you have room on your property. Learn more about bees and their life cycles.